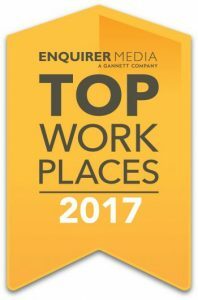 Cincinnati, Ohio June 4th, 2017- Donnellon McCarthy Enterprises has been awarded a 2017 Top Workplaces honor by the Cincinnati Enquirer. The Top Workplaces lists are based solely on the results of an employee feedback survey administered by WorkplaceDynamics, LLC, a leading research firm that specializes in organizational health and workplace improvement. Several aspects of workplace culture were measured, including Alignment, Execution, and Connection, just to name a few. Since 1957, Donnellon McCarthy Enterprises (DME) has been on a technology advancement stage, transforming businesses by providing a powerful array of process automation in both the digital imaging industry and intelligence tools for software. By focusing on providing total business solutions, DME ensures that our clients have all the resources necessary to improve efficiency, reduce costs, and achieve performance benchmarks. Thousands of organizations, both large and small, trust DME to handle their technology needs. Our broad scope of services encompasses an extensive portfolio of office equipment, document automation and technology solutions, and our highly tenured team has deep experience across multiple verticals including education, legal, healthcare, finance and the public sector. At Donnellon McCarthy Enterprises, we take pride in our unmatched customer service and the strong relationships we have built with our valued customers. More than 70% of our staff holds positions centering around customer service. We provide support for more than 10,000 pieces of office equipment and stock over half a million dollars’ worth of repair parts. This enables us to resolve our customers’ problems efficiently so they can stay focused on running their businesses. That’s our tagline here at Donnellon McCarthy Enterprises (DME) and we don’t take those words lightly. Our team is comprised of talented, hard-working people with the skills, experience and resolve to do what’s right for our customers day after day, year after year. Because we demand a lot, we strive to take care of all our teammates by offering top-notch compensation and benefits packages which includes profit-sharing options. At DME, we work hard and play hard. From our annual Halloween and Christmas parties to our family BBQ and chili cook-off, DME’s culture is centered around strengthening, building and rewarding our team. We want all our teammates to grow professionally and enjoy coming into the office every day.